Along with storing food, storing garden seeds should be of primary importance for any well-prepared individual or family. There are many indications that there is a major food shortage right now and that it will continue to grow worse in the coming years (see here and here for some good explanations into this crisis). Given the right conditions, it could get bad enough that food becomes more valuable than gold or silver. In times like these, having a backup of seeds that can be planted as a “crisis garden” to supplement or support the needs of your family will be worth more than its weight in gold. What Types of Seeds Should I Store? The most important types of seed you’ll want to store are seeds that consistently put out the same type of plant/fruit generation after generation. In other words, if you were to plant the seeds of the parent then the fruit/vegetable that is produced by those seeds would maintain the characteristics of the parent plant. For the beginning gardener this includes purchasing open-pollinated seeds instead of the typical hybrid seeds found in your garden center. As a general rule (there are exceptions), hybrid seeds are first-generation seeds and if you were to use the seeds produced by one of these plants they will be sterile or more likely fail to breed – not a good option if next year’s crop is dependent upon the seeds produced by this year’s. This also requires a yearly visit to the garden center — a dependency that’s great for the seed dealers but not so great for the survivalist. Heirloom seeds are a type of open-pollinated seed that have been conserved by repeatedly growing them out again and again over the years. These are perfect for seed storage. With all the seed sellers out there here are the companies where I recommend you purchase your open-pollinated and heirloom seeds. I’ve broken them down based upon the climate where the seeds are produced and tested. This will ensure the greatest success of germination and production in your area. 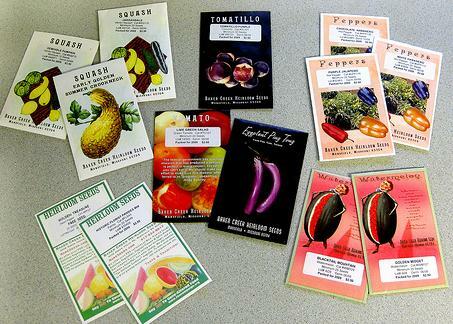 (Be sure to order the open-pollinated or heirloom seeds as these companies also sell hybrids). Now that you’ve grown your open-pollinated seeds and have fruits and vegetables that are producing their own seeds, you’ll now want to be able to store those seeds for the next year. If seeds are stored properly, they can last for years (10+ or more). The three big killers when it comes to seed storage are temperature, moisture, and oxygen with the most important being temperature and moisture. For the ideal temperature, store them in an area that is 40 degrees Fahrenheit or below (refrigerator or freezer) and to combat moisture, the best process is to dry them to 8 percent moisture or less by drying them at 100 degrees F for six hours. Sun Drying: Spread the seed out in the sunlight and try to obtain 100 degree temperature for 6 hours. Longer times are expected if the temperature is less. Food dehydrator: Set the dehydrator to 100 degrees F. Dry for six hours. Conventional oven:Keep the oven door open several inches, and make sure the seed is not heated to more than 100 degrees for 6 hours. Longer seeds should snap smartly and cleanly in half when bent. Wheat, beans, peas, corn and other large seeds should shatter and turn to powder when hit with the head of a hammer. Once your seeds are dry, you’ll want to place them in an airtight moisture-proof storage containers. Be sure to mark the containers with the seed names and date of packaging, then store them in a cool dark place (again a refrigerator or freezer are ideal for this purpose). Survival Seed Bank: They also provide a book that describes in detail how to plant your seeds, cultivate them as well as how to gather and store your seeds for the next growing season. Heirloom Organics: These guys provide multiple “seed packs” based on the size of your family and needs. – A great study on moisture, temperature and o2 effects. http://www.savingourseed.org/pdf/SeedProcessingandStorageVer_1pt3.pdf – In depth look into the process of saving your own seeds. Garden Web Seed Saving Forums – This forum/thread has some good dialogue on the process behind saving your own seeds. Regarding seeds – Costco sells a bucket of non-hybrid seeds but I really don’t know what to look for. How do I know if they are open pollinated? If you go to their site and search “seeds”, it will pull up the bucket I am referencing and I would really appreciate your feedback! Thanks! Great question and sorry for the slow response. In a nutshell, non-hybrid seeds are open-pollenated. The benefit of this is, if you were to plant those seeds and let the resulting crop go to seed, these in turn will maintain the characteristics of the parent plant. Based on this, the Costco seeds seem to be a good buy. As a word of warning, keep in mind that even though those seeds may be non-hybrid, they still may not be the most ideal for your location. In other words, if Costco’s seed dealers grow their seeds in the mild climate of the Bay Area of California, these seeds may not grow as ideally if you lived in the Northeast and you planted them in that climate. Since those seeds have adapted to the California climate, it’s resulting offspring would maintain those adaptations. However, as a survival seed bank, that big bucket of seeds wouldn’t be a bad idea. And if you have the time and inclination, you can also begin planting those seeds in your environment, developing generations of seeds that are more acclimated to your environment. Thanks Chris. I’ll make that update. Great info. It is indeed helpful to have a survival seed bank. Thanks! it is very vital to have a survival seed bank. We have to prepare ahead of time so that we will not regret it in the long run. It’s so true yet so sad how a majority of the population doesn’t comprehend this. Great thanks for sharing the importance of seed banks with us. This will be really helpful for the readers who love gardening or farming. Thanks for sharing this with us.